I mean, there's a reason that the national sport of Britain is queuing, right? Typical American, doesn't understand the finer points of the British psyche. Sport requires a winner (usually whichever team is competing against Team GB). There are no winners in queuing. Everyone loses, the point of queuing is to ensure that everyone else loses at least as much as I do. Which is a quintessentially British mindset. Cheerio, pip pip, tea biscuits cake. the Eton Wall Game makes so much more sense now. James O'Brien asks a caller "which EU law are you most looking forward to losing"
Ashley from Pinner said that he was willing to take a "short-term" hit on his business in order to free Britain from the bureaucratic red tape of the EU. James asked for just one European law that he was excited to repeal. And Ashley couldn't name a single one. Eventually, Ashley laughed as he said: "The shape of your bananas." But James responded: "It's not funny, is it? The pound is at the lowest it's been since 1985, you just said "any law" and I'm just asking you to name one. "We both know that bananas was a lie made up by Boris Johnson. Remind me which side he was on during the Leave campaign. "What is the law? You know you were going to take short-term economic damage, you knew that all your customers would do as a newly-formed electrician company. Every single customer in the country is going to be potentially worse off than they were before the vote. "So I'm just wondering what those laws are that you won't have to obey any more that made you vote for this short-term economic hit. Ashley's response: "I wouldn't be able to, no." He's looking forward to some Proper British bureaucratic red tape, none of this foreign muck. The major irony is that the regulation of fresh fruit in the EEC (former EU) was based on the British red tape. So, Sturgeon is going to take another stab at the whole independence question. This seems predicated on if the Tories following through on their hard Brexit threats. It can also be seen as a bargaining chip that could see Holyrood gaining more power from Westminster. The politics on this aren't 100% clear. In other news, two giants of retail goods had a public spat today. Unilever and Tesco fought over the price of the former's goods on the latter's selves. This is due to Sterling taking a nose dive after May's March exit date. Finally, it seems that if May thought here hard Brexit stance would worry the remaining EU leaders into offering concessions, it appears it hasn't. Oh and there is a court case challenging the presumption that the UK government can trigger Article 50 without consulting Parliament. ... "What? Racist! Is that all it's got to say? Racist! One word! ... Well, for God's sake I hope you managed to rectify that a bit." "Mostly racist," admitted Ford with a slightly embarrassed cough. Jolly Bill this is perfect. Can I post this elsewhere? Isn't this the equivalent of breaking up with your girlfriend and expecting her to beg you to take her back and then you're shocked when you find out she's actually out having a great time and never talks about you? I wouldnt say EU is out having a great time. It's more like when you break up with your girlfriend and think you'll be able to sleep with all the women you want but the only women you know are your girlfriend's friends and they all hate you. Uh I thought it was quidditch. Someone retweeted the only Brexit-related thing to make me smile in the last 6 months where their typical racist screed had somehow autocorrected "Brexit" to "Brecht". The concept of Brexit as an theatrical magical reality meant to highlight the artifice in our own realities makes as much sense to me as anything else to do with this depressing lemming-march towards the cliff. We're supposed to blend, Q-stone, not reveal ourselves to the Muggles at the drop of a hat. *I love how this is under the "Money" section of CNN. While I think it was a dumb vote it feels like a pretty big insult to the people if parliament was to block the exit. I think it would send a message to the people that they actually don't have a say in their government at all, which seems bad. Damn them for giving me hope for 60 seconds before this one brought it all down again: High Court Brexit Ruling: What Does It All Mean? TLDR: it won't make any difference because MPs don't have the spine to risk getting voted out, so even if they voted Remain, they'll vote Brexit on a Commons vote. Only a general election could remove the assumed People's Mandate To Be Racist and Xenophobic. I took the main point of the exercise as MPs must have a say on the degree of Brexit rather than preventing it completely (which I doubt most MPs in the big two parties would fancy trying). Stupid tautology of the year, 'Brexit means Brexit' is kind of like saying 'Divorce means Divorce' without working out who gets the children on which days of the week. I think that any referendum decisions that vote to do things that are Constitutionally (taking the US version rather than the UK) the purview of specific government bodies should naturally be validated by those bodies. For example, if a US referendum voted to declare war on Iran... that's Congress's job. 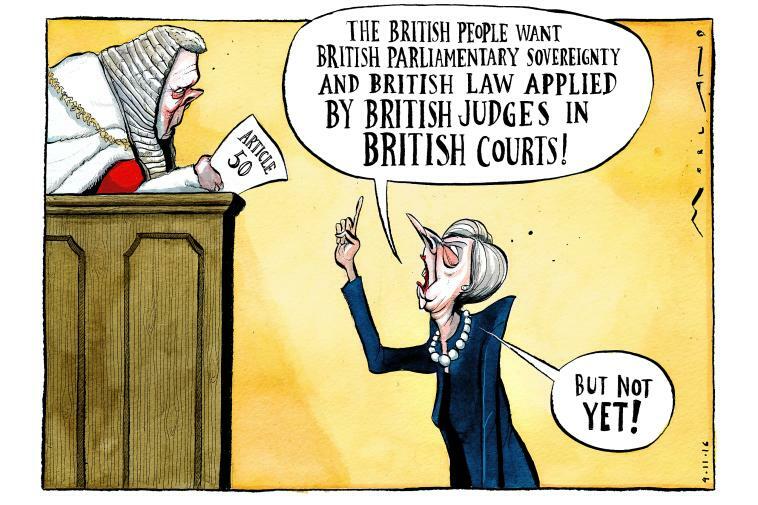 If memory serves the UK is different in that they don't have as cohesive of a single document like the Constitution that defines these roles, but they still have their own heritage of laws and rules and systems like the courts that decreed that Parliament should be involved, so I think the comparison applies. While I think it was a dumb vote it feels like a pretty big insult to the people if parliament was to block the exit. It is not like if we don't show you the way to the next whiskey bar it will cause harm. How does this not trigger a general election? This is not a party policy and will result in a complete free vote in Parliament. It could also trigger a split of both Tory and Labour parties (maybe some Lib Dems) into a more centrist party. Not that a General Election would avoid that either. The more I think about this ruling the more I see that it has put the cat among the pidgens. According to that Guardian article, Tory MPs are terrified of UKIP snatching their seats. The current Labour leadership are Eurosceptics and want it anyway. No aspect of this makes sense to me, and any view of Brexit that doesn't expect massive problems for the UK economy is just blind. We have no cards to play and have nothing that the EU wants. They seem to think they'll turn up with a radio playing God Save the Queen and pictures of Nelson & Churchill, and somehow the EU will give us what we want. We're a massive parasite on the EU - they'll be glad to be rid of us. I don't understand why anyone would want Brexit in its current form who isn't just being a Enoch Powell-era fool. Yes but it still remains a fact that both the majority of both Tory's and Labour's MPs do not support leaving the EU. The obvious solution is for May to call a snap election. Labour and UKIP are in a complete mess. The SNP and Lib Dems might see gains but I'd suspect it would be a Tory landslide in the morning. Of course, that is all predicated on the notion that May actually wants to leave the EU. I'm still not convinced she is not playing a longer game here. I've been forced to use the Reddit Enhancement Suite with very heavy blocking to keep /r/all even vaguely useful. Without RES, it's just an avalanche of noise and hate. I find it rather frightening, to be honest. Theresa May basically BACKS the tabloid Newspapers that called the three Judges in the recent brexit parlament ruling "Enemies of the State".